I start my walk from the abandoned village of Tyneham. 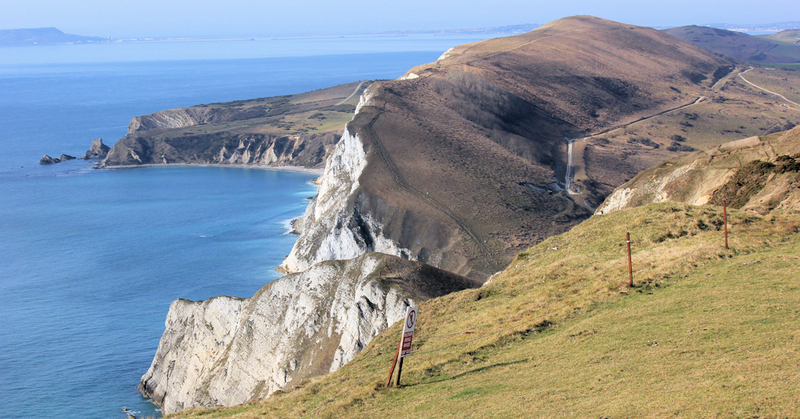 There is a long track – nearly a mile – from the car park at Tyneham to the coast of Worbarrow Bay. I am glad there is nobody about to see me as I huff and puff my way up the slope. The steepest bit is at the top. Just when I reach the final scramble, a couple of walkers appear above me. They are older than I am and appear to be not at all out of breath. It transpires there is an easier way up. I have come the hard way. 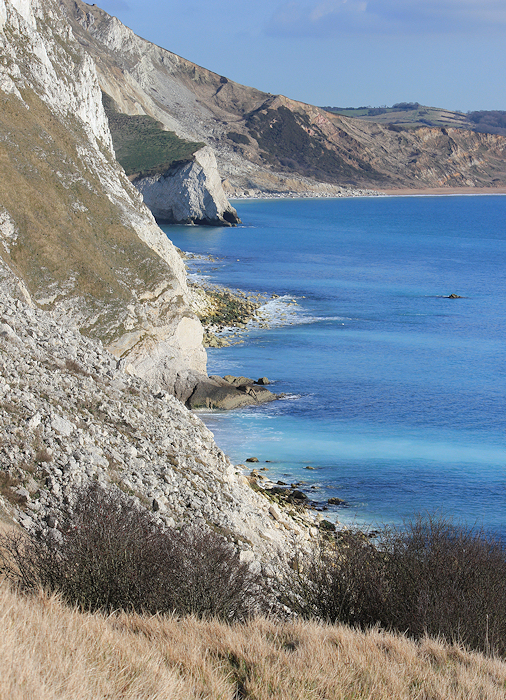 On the way up, I take photographs of the views down into Worbarrow Bay. The sun is shining, the air is clear and the sea is blue. What a difference good light makes! Today is a magical day for photography. From the top, I get a view clear across the sea to Mupe Rocks, to Weymouth and to the brooding bulk of Portland beyond. The view inland is equally stunning. I can look down on fields and farms and cattle. I see a castle and later I find out this is Lulworth Castle, built in the 17th Century as a hunting lodge. It is open to the public on most days, but not on Saturdays – when it is used as a venue for weddings. I am up on Rings Hill. Below me are steep chalky cliffs and I can look down into Mupe Bay. The high hill above the bay is called Bindon Hill and the rocks protruding at the far end of Mupe Bay are called Mupe Rocks. But before I reach Mupe Bay, I have to contend with Arish Mell. The descent down to sea level is steep. But, as I glance across to the rising hill ahead of me, I can see the next ascent is even steeper still. In fact, it turns out this is one of the steepest slopes I encounter. It has steps cut into it and is reasonably safe to climb, but takes me some time. Arish Mell is a delightful little cove with a perfect semicircle of shingle beach. 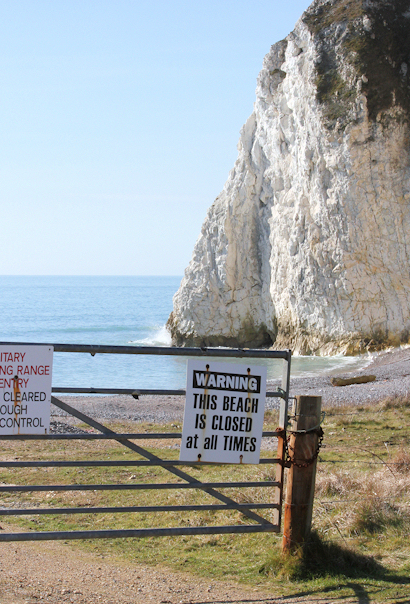 The area is part of Lulworth Ranges and only open at weekends or holidays, when the ranges are not in use. The beach is never open to the public and is fenced off. There are a number of walkers out today; they have come to enjoy the sunny weather and to take the opportunity to get weekend access to this land. As I make my way up the very steep slope on the other side of Arish Mell, I am overtaken by a variety of walkers – many older than me. I console myself with the thought that few of them will have walked as far as I have today. All around are rusting mechanical devices, old tanks, transporters – reminders of what this area is used for: targets for the shooting practice that takes place here during the days when the ranges are in use by the army. 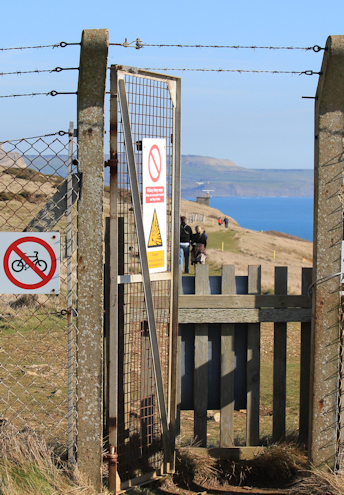 When I eventually reach the top of hill – Bindon Hill – above Arish Mell, I have a great view down into the cove and I take a number of photos of this ‘forbidden’ beach. This is a glorious day. I can’t believe it is still February. Beyond is the curve of Worbarrow Bay and I realise I have not travelled very far, despite much effort. In fact, I can see quite clearly all the way back to Worbarrow Tout, where I ended my walk the day before. Beyond is the headland of the Kimmeridge Ledges and, further in the distance, the high cliff of St Aldhelm’s Head. When I walked on St Aldhelm’s Head a couple of days ago, it was chilly and covered in mist. Today, it is clear and beautiful. Ahead are the striking rocks that mark the end of Mupe Bay. And another beach, with people walking down the path towards it. I come down off Bindon Hill. 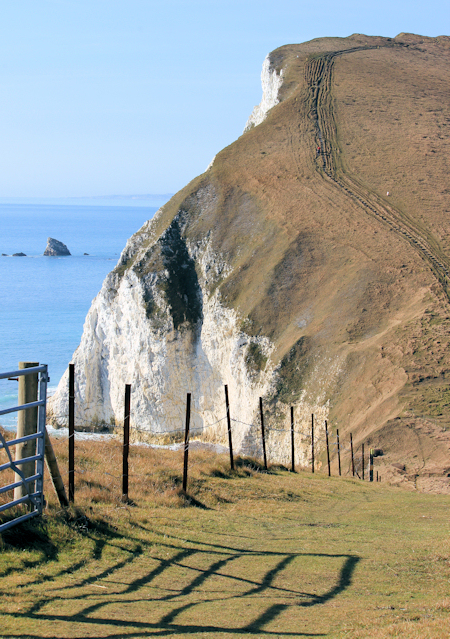 There is a footpath that continues along the crest of the hill, all the way to Lulworth. But I am going to follow the official South West Coast Path, and this leads down to the lower land and follows the coast along to Lulworth Cove. The climb down is steep. In some places it is a scramble. I stop to catch my breath and take more photographs of the blue sea and the white cliffs. 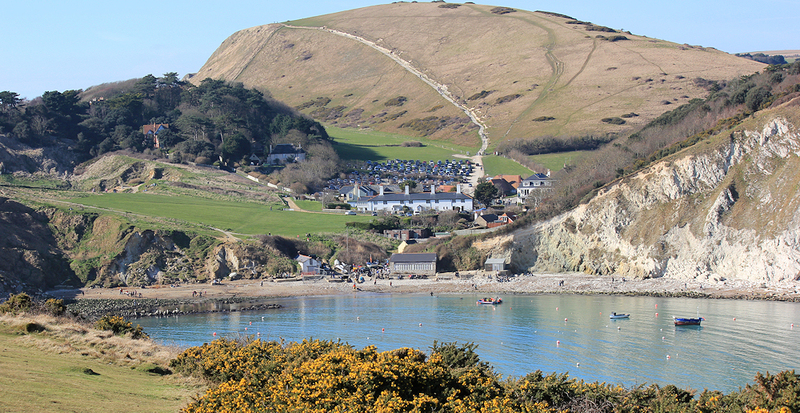 I am getting closer to Lulworth and there are more people around, a steady stream of people climbing up this path. Some look better equipped than others. They all look hot and bothered. I am glad to be going downhill. I am also very glad to have my stick. This descent would be treacherous without the extra help of my wooden pole. A couple of ladies, both armed with proper hiking poles, are making their way up the slope and I stand aside to let them follow the path. They notice my makeshift stick. And the socks. “Are those socks on the end of your stick?” I explain I forgot my walking poles. As I walk above Mupe Rocks, I notice some canoeists in the water. They are paddling through the rough, white water around the rocks. It looks like fun. Further along and I see a group of climbers. They are making their way up the shoulder of one of the rocks. Some have already reached the top, where they seem to be placing ropes and are about to make an abseil descent down from the top. But the area of cliff I am walking along is gentle with rolling dips. It is easy walking and I make good progress. The gorse is beginning to flower – yellow just breaking through the green shrubs. I reach a section where the cliff has crumbled away. Exposed below are ledges with strange rock formations. I realise I have reached the famous Fossil Forest. The trees – 135 million years old – were ancient conifers called gymnosperms. The tree trunks became ‘fossilised’ when they were gradually buried and coated in sediment. The ‘fossils’ in the photos are the outer casings left by the solidified sediment. 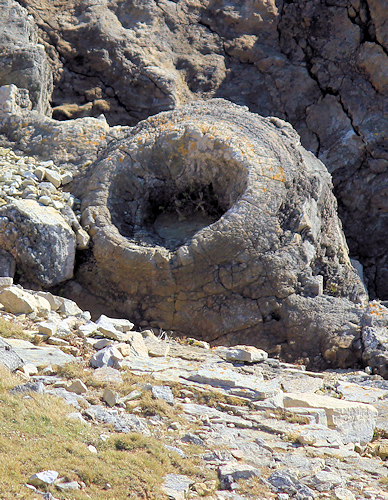 You can read a detailed description of this amazing geological phenomena on Dr Ian West’s site. I am sorry to finish this section of the walk. Looking back, I enjoy the view one last time. A couple of walkers are just starting out. I hear the young woman say to her male companion, “We can do the trip up to the hill and around in an hour. It is only three or four miles.” They are wearing ordinary shoes and have no poles. I think of the steep climb up above Mupe Bay and I suspect they are not going to get as far as they think. 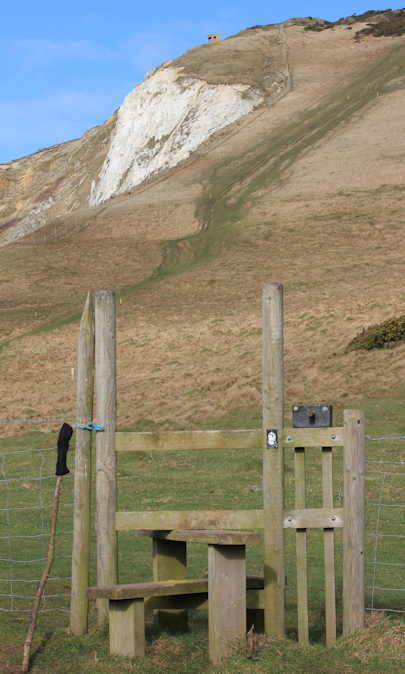 I walk through the gate that marks the end of the Lulworth Ranges. I am sorry this section of the walk has come to an end. It has been a privilege to walk through this area of unspoilt and undeveloped land. When this section of the coast was cleared for use by the army during the war, the clearance and subsequent retention of the land for military training was controversial. People lost their homes (the ruins of Tyneham are a testament to this) and in some cases their family heritage. But the result has been an area of conserved landscape for all to enjoy – when the ranges are open to the public, of course. 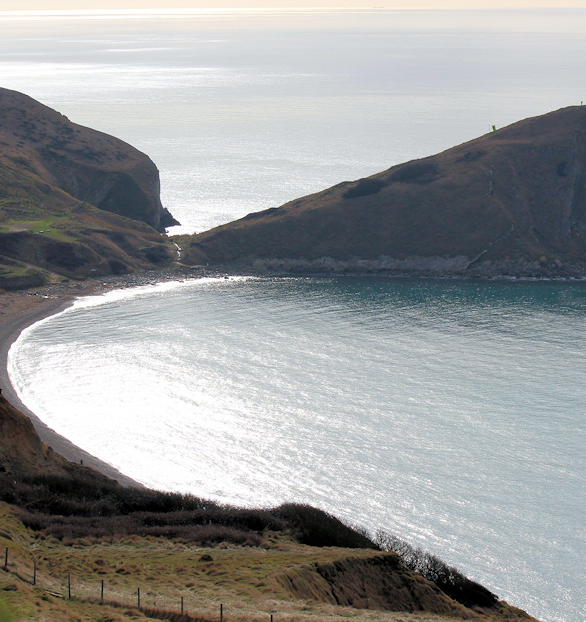 Then I am on the edge of the basin that houses Lulworth Cove. The sun is still shining. The sea is calm and blue. There are sailing boats and a small cruise ship is gliding into the cove. The scene is truly beautiful. I stand for some time enjoying the view. Despite the arduous hill climbs, I am ahead of schedule (I thank my stick) and have plenty of time to walk around the shore to the where the road comes down to the cove. I scramble down the steep incline to the shingle beach and make my way along the shore, past the groups of people visiting today. The beach is hard work. I stumble across the pebbles until I reach the roadway. My walk today is ended. But ahead I can see tomorrow’s path, rising up another hill. 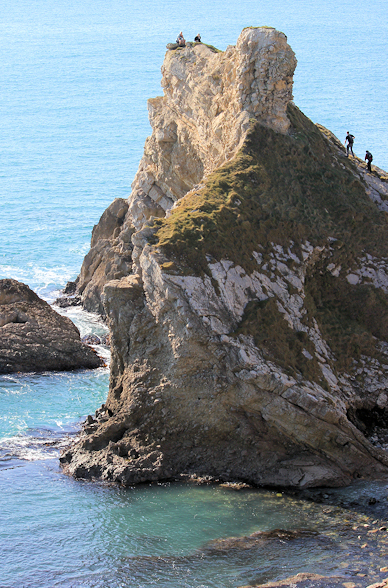 The high point of today’s walk was Lulworth Cove. There is so much hyperbole spoken about this beauty spot that I was prepared to be disapointed. Indeed, I tried not to like it. But I failed. On this sunny day, it was beautiful. Here is the painting of Lulworth, as done by my Artist in Residence, the wonderful Tim Baynes. You can learn more about Tim Baynes and the paintings he has created for me on this page. Miles walked: a little more than 5 miles. Took me 4 hours. This is, possibly, my slowest walk ever! 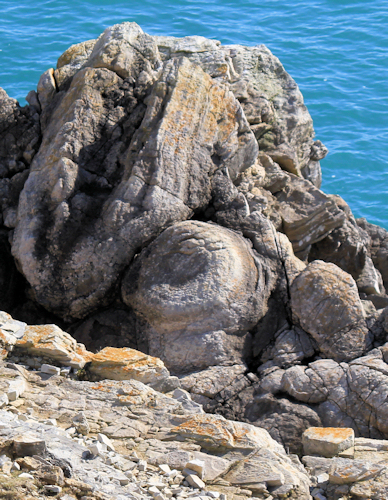 This entry was posted in 08 Dorset and tagged coast, fossils, photography, travel, walking. Bookmark the permalink. Thanks for sharing your Coastal Walk with us! 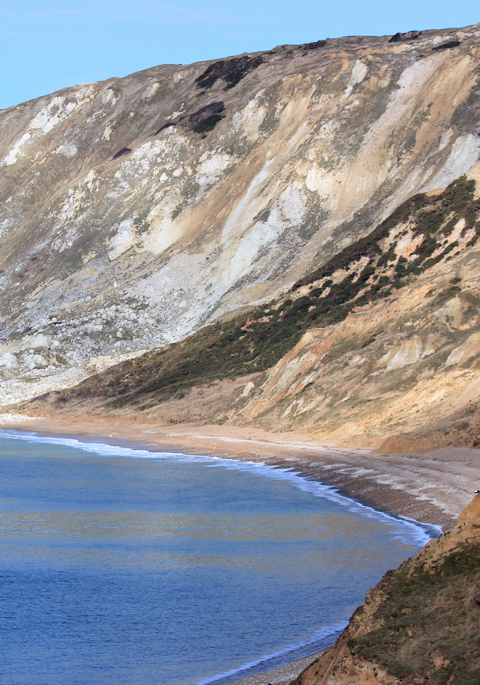 The weekend before I did the Lulworth Cove to Mupe Bay Part and this weekend I showed Warborrow Bay to a friend from Germany: We both (me again) were impressed about the beauty of the coast! I’m doing much smaller walks than you because I always have to go back where I come from. 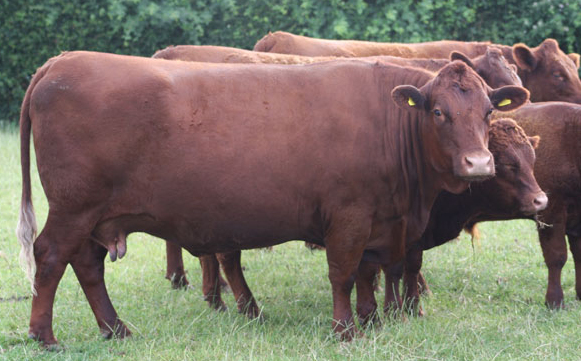 But I’m getting there – there is no rush! In the meanwhile I read your blog to get excited what’s next! Another beautiful day walking in Ruth’s footsteps. We chickend out and did the easy way up to Worbarrow Bay (as Ruth mentioned) by parking at Whiteways view point car park (marked as Povington Hill on the OS map) instead of Tyneham village, but all that did was save my legs for fhe next big hill! 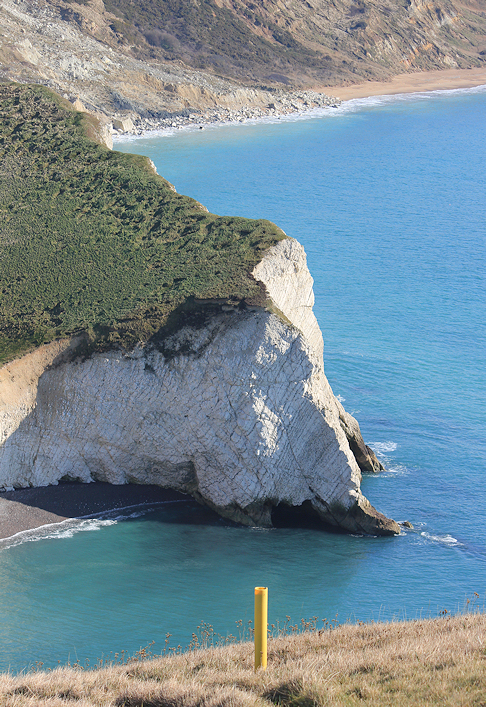 It is free to park at Whiteways which helps to offset the exorbitant parking charges at Lulworth Cove! Very slippery underfoot. slipped several times depite the walking poles but without them it could have been a tumble on the steep downhill bits. Still taking 2 cars each time to make life easier and to walk further. It certainly is a joy to see what we will be experiencing on each journey before we even set out. It would have been easy to miss out on the fossil forest if we had not read about it first although we were foolish to scramble down the side of the hill and back up again to see the forest only to find the steps down to it a few meters further on by the Lulworth range boundary fence! But I was determined not to miss them even if it was a foolish thing to do. Friends are now starting to join us which makes this a very social event. Thank you for taking the trouble to record your journey. More beautiful photos of the scenery and the Fossil Forest looks incredible.